LONDON– According to a study by SEI (NASDAQ: SEIC), Standard Chartered Private Bank and Scorpio Partnership, the more opportunities banks create to connect digitally with their clients, the greater the chance they have to inspire their brand loyalty. The final report in the 2012-2013 Futurewealth series, entitled The Digital Future of Client Relationships, considered 16 leading global brands that have been recognised for having successful digital marketing strategies and that have a strong following among Futurewealth customers. It finds that the brands that have embraced the multi-faceted nature of digital relationships also have a greater influence on their customers’ purchasing decisions. Importantly, wealthier customers are more influenced by multi-channel marketing than their less affluent peers. For example, respondents with personal wealth of more than USD4 million, are 40% more likely to be influenced by a multi-channel strategy from a bank than clients with wealth less than USD500,000. Yet, banks are lagging behind other kinds of luxury provider when it comes to fostering connections with clients digitally. For example, wealthy individuals who own luxury cars find the digital marketing from those firms to have an importance of 6.6 out of 10 in their purchasing decision. For banks, the equivalent number is 5 out of 10. 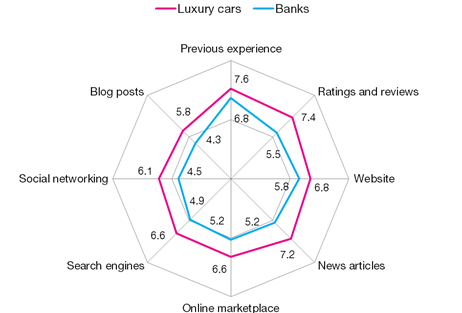 Luxury car owners also graded the quality of ongoing digital contact with car companies at 7.1 out of 10 versus 5.9 among the wealthy clients of banks. Of note, wealthy clients from the Asia Pacific region rated the on-going digital contact from their banks slightly higher, with a grade of 6.6 out of 10. However, in Europe there is evidently need for improvement with an on-going digital performance rating of just 5.5 out of 10. “The uptake of digital channels amongst high net worth clients and the increasing influence of these channels on decision-making cannot be ignored. This is a new era of client engagement and more should be done to recognised these meaningful changes in consumer behaviour. I look forward to exploring new digital opportunities for ourselves and our clients,” says Shayne Nelson, CEO of Standard Chartered Private Bank. The paper also considers the interrelationship between digital marketing strategies and brand loyalty. This year’s Brand Love index, which measures three dimensions of a customer’s long-term relationship with a firm (warmth, commitment and excitement), comprises only firms that have been recognised for their digital marketing approach and finds almost all of them have increased their standing in the eyes of customers and clients. Banks have increased their Brand Love most, with a 7.2% improvement since 2011. However, once again, luxury car companies stand out for inspiring the most Brand Love among their clients, with an average Brand Love score of 86 points, versus 71 points among leading international banking brands. This report is the final chapter in this year’s four-part series, which together are a component of the larger Futurewealth Project. Each report in this year’s series focuses on a different aspect of the theme of how technology and digital communications can be used to engage the up-and-coming global wealthy. The previous reports in the series have included: The Digital World of the Futurewealthy, Stepping into the Communication Age and Helpful Investment Technology. The reports are available online and are based on the views of 3,477 of the world’s up-and-coming wealthy, who have an average net worth of USD1.9 million. More broadly, the Futurewealth Project aims to better understand the ambitions and consumer attitudes of the world’s Futurewealthy clients. In total, 3,477 individuals took part in this fourth global poll of the Futurewealthy. The average level of wealth among these individuals was USD1.9 million. SCORPIO PARTNERSHIP IS THE LEADING CONSUMER INSIGHT AND STRATEGY CONSULTANCY TO THE GLOBAL WEALTH INDUSTRY. The firm specialises in understanding and researching a cross section of wealthy clients from UHNW individuals to wealthy investors and the mass affluent. We benchmark their behaviour and opinions, focusing on the financial institutions, private banks, family offices and wealth management brands they interact with. We have developed four transformational disciplines – SEEK, THINK, SHAPE and CREATE – each designed to enable business leaders to strategically assess, plan and drive growth. We specialise in turning financial research and customer segmentation studies into actionable consumer insight that can stimulate UHNW client engagement. The solutions Scorpio Partnership develops regularly win awards for institutional clients and we are recognised global experts in our field. Scorpio Partnership has conducted more than 300 global market research, strategy development and consumer insight assignments straddling all sectors of the wealthy industry. We work with institutions in the banking, fund management, regulation, IT and technology, insurance and charity and not-for-profit sectors. Scorpio Partnership has been voted best global consultancy to the wealth management industry for three consecutive years (2007-2009) and has been runner up for Agency of the Year two years in succession (2010-11) and was the runner-up in 2012 for the Judges Award for Financial Services Insight. The firm is currently in the final shortlist for the 2013 Thought Leadership of the Year in Asia. * The firm is independent and owned by management. Standard Chartered Bank is incorporated in England and Wales with limited liability by Royal Charter 1853, Reference number ZC 18. The Principal Office of the Company is situated in England at 1 Aldermanbury Square London EC2V 7SB. Standard Chartered Bank is authorised and regulated by the Financial Services Authority under FSA register number 114276 VAT number: GB 244106593. SEI (NASDAQ:SEIC) is a leading global provider of investment processing, fund processing, and investment management business outsourcing solutions that help corporations, financial institutions, financial advisors, and ultra-high-net-worth families create and manage wealth. As of March 31, 2013, through its subsidiaries and partnerships in which the company has a significant interest, SEI manages or administers $495 billion in mutual fund and pooled or separately managed assets, including $206 billion in assets under management and $289 billion in client assets under administration. For more information, visit www.seic.com.